If you are travelling to the Island of Pag from Zadar and points south, the island is reachable from Posedarje on the mainland via Pag Bridge, which takes visitors to the island’s south end.” Jadrolinija” ferries make hourly runs from mainland Prizna to Zigljen on the island’s north end, depositing visitors about 4.8 km (3 miles) from Novalja. When demand is high during peak season, the ferries often throw out their schedules and leave port as soon as they are full. A one-way ferry ride for a car with two people costs about 100kn. Pag is only 360 km from Venezia, more or less 600 km from Vienna, and 250 km from Ljubljana. Documents: When arriving in Croatia by car it is requested that you carry a valid driver’s license, car registration card and your Green Card (proof of car insurance). Speed and alcohol limits: Speed limit in settlements is 50 km/h and 80 km/h in out of settlements (unless stated differently). On highways the speed limit is 130 km/h. At this moment, the maximum permitted level of alcohol in blood is 0%. Petrol stations: In Croatia, petrol stations are open from 7 am to 7 pm or 8 pm every day and during the summer until 10 pm. There are also petrol stations that are opened round the clock in the larger towns and on main international routes all petrol stations sell: Eurosuper 95, Super 98, Normal and Euro Diesel. Zadar Airport ( 87 km distance from Novalja). Rijeka (117 km distance from Novalja). Split (188 km distance from Novalja). Zagreb (233 km distance from Novalja). Other airport options include: Pula (237 km) and Dubrovnik (423 km) or you can opt traveling to bordering countries: Slovenia (Ljubljana) and Italy (Trieste and Venice). 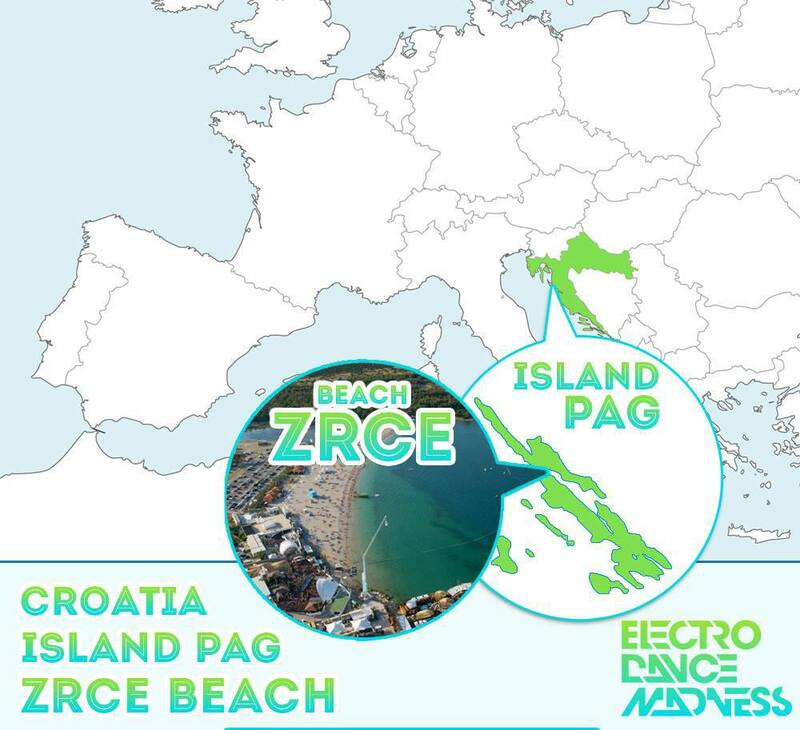 We recommend flying to Zadar, as the nearest airport to your party destination Novalja and Zrce beach (EDM Festival venue). Zadar Airport is only 50 miles far away from Novalja and has the easiest, cheapest and shortest transfer time to the festival venue. When traffic conditions are favorable you can easily make the journey in just one hour. The airport Zadar is served by Ryan Air from Liverpool and London Stansted. The national airline company flying to and from Amsterdam, Berlin, Brussels, Dusseldorf, Frankfurt, Istanbul, Copenhagen, London, Madrid, Milan, Moscow, Munich, Paris, Prague, Rome, Sarajevo, Skopje, Vienna, Zurich, Tel Aviv, and, seasonally, to Manchester. German Wings, Ryanair, Adria Airways, Aeroflot, Air Bosnia, Austrian Airlines, Air France, Avioimpex, British Airways, Lufthansa, Malaysia Airlines, Malev and Swissair. For those after an adventure in Croatia it would also be well worth checking out the settlements of Rijeka, Pula or Dubrovnik. Ljubljana in Slovenia is easily reached on a budget via Easyjet and Trieste in Italy is also accessible via a Ryanair flight. Croatia Airlines is the national airplane company in Croatia.